Where can I get a new controller for my electric blanket? 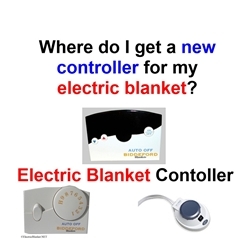 My control for my electric blanket or heated mattress pad stopped working can I buy a new one from your store?" NO - Only the manufacturer can sell you replacement parts or handle any warranty issues. WE ARE NOT THE MANUFACTURER OF ANY ELECTRIC BLANKETS PLEASE DO NOT CALL ElectricBlanket.NET. We will refer you to this video.